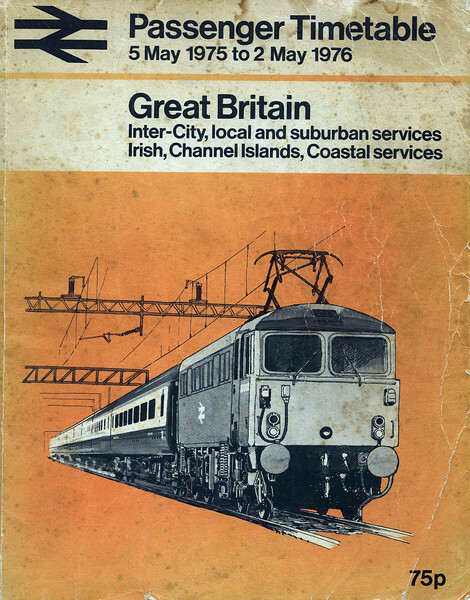 Back in 1975 the Electric Scots adorned the timetable's cover, the headline grabbing 5 hour schedule of the Royal Scot (Euston 10:45, Glasgow Central 15:45) was comfortably faster than the Flying Scotsman's five and a half hours from Kings Cross to Edinburgh. Of course HST introduction on the Western Region was only a year away and would eclipse, in speed terms, both Anglo Scottish routes in due course. Interestingly many preserved lines were also included as are Irish Sea and Isle of Man ferries, and those to Orkney and Shetland and the Channel Islands. Continental services are in a separate timetable. What is immediately apparant comparing 2013 with 1975 is the increase in frequencies on almost all lines. That brings back memories. The combined timetable volume, known by my local rail enthusiasts as the work of fiction. Wish the price was still 75p just looked at this years edition £26. Nice find thanks for sharing. Hello Ben - yes I'll scan those tables, it won't be for a few days through. A fascinating glimpse into the past. Is there any chance that you could upload the tables between Lincoln/Newark/Nottingham from the era too? Many thanks!